Universal City, CA– “The Horrors of Blumhouse” makes an encore performance at this year’s Halloween Horror Nights, bringing leading producer of horror Jason Blum’s blockbusters to life in all-new mazes at Universal Studios Hollywood and Universal Orlando Resort, beginning Friday, September 14. Partnering with the creative minds at Blumhouse Productions (Get Out, Insidious, Split), Universal Studios Hollywood and Universal Orlando Resort will unleash a series of Blum’s most terrifying films at the nation’s most intense and immersive Halloween events. At Universal Studios Hollywood, “The Horrors of Blumhouse: Chapter Two” maze takes guests on a terrifying journey that begins at the entrance to a dilapidated movie theatre, where a compilation of horror films play out in real life. 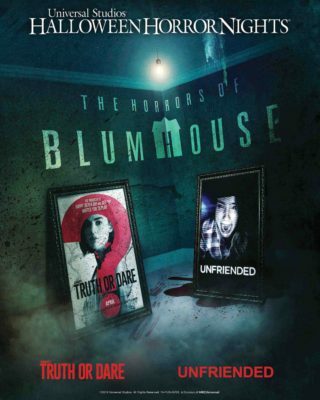 In Blumhouse’s Truth or Dare, guests will succumb to an ancient curse that has been unleashed by a group of unsuspecting college students….forcing them to play a game where the stakes are life and death. In Unfriended, guests become pawns to a supernatural entity that has invaded a chat room. Drawing inspiration from Blumhouse Productions’ infamous opening title sequence, the final feature will lure guests into a creepy old house to answer desperate cries of help…only to discover that they have actually entered a paranormal world where real-life nightmares threaten to trap them forever in misery. At Universal Orlando Resort, “The Horrors of Blumhouse” maze will bring guests face-to-face with the most gruesome scenes from the déjà vu thriller Happy Death Day, as well as from The First Purge, the newly-released prequel to The Purge series. In Happy Death Day, guests will be transported to the film’s college town, where they will be forced to relive the last day of a student’s life over and over again…until she breaks the murderous cycle. Then, in The First Purge, guests will run for their lives as menacing citizens from the film hunt them as part of the first barbaric government experiment where all crime is declared legal for 12 hours. Universal Studios’ Halloween Horror Nights is the ultimate Halloween event. For more than 25 years, guests from around the world have visited Halloween Horror Nights to become victims inside their own horror film. Multiple movie-quality mazes based on iconic horror television shows, films and original stories come to life season after season. And, the streets of each park’s event are transformed into highly-themed scare zones where menacing scare-actors lunge from every darkened corner. For more information about Halloween Horror Nights at Universal Studios Hollywood and Universal Orlando Resort, visit www.HalloweenHorrorNights.com. Additional details about the events will be revealed soon. All tickets and vacation packages are now on sale.